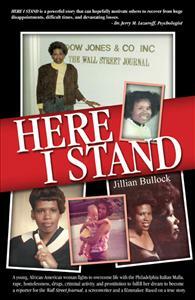 HERE I STAND tells the unforgettable true story of a young, African-American woman who defies the odds by becoming a reporter for the Wall Street Journal newspaper, an award winning filmmaker and a competitive athlete after she overcomes life with the Italian Mafia, drugs, violence, criminal activity, homelessness, prostitution, and murder. Despite the adversity Jillian faced she refused to be defeated, to quit, or to turn her back on her dreams. Her unforgettable and inspiring story is courageous and poignant, and serves as inspiration for all who are in difficult situations or who are battling tremendous hardships or obstacles.